This is a short post that might save someone some valuable time, if Google decides to rank it high enough. Apparently the connector does not support upgrades from 5.1.x to 5.2.x. We should just remove the old one. Here lies the problem: when I tried removing the old 5.1.3, I got a weird error of which I took no screenshot. It consisted of a blank error message showing a computer screen with a icon of a moon on it. Something resembling a "sleep mode" icon. Huh? Anyway, to make a long story short, nothing I did to remove the 5.1.3 gracefully worked. I tried using the old .MSI file, tried reinstalling, changing the install configuration, editing registry keys... I also tried using msizap.exe. Nothing worked. 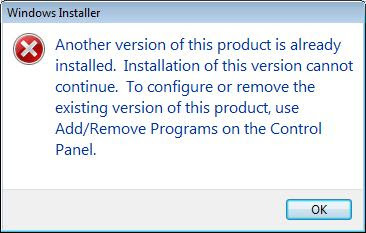 The solution was to use this tool from Microsoft - called "Windows Installer CleanUp Utility". It's supposed to be a wrapper for msizap, but it did the job, while msizap did not. Regardless of MySQL, this is a good tool to be familiar with. It removed 3 other entries in my "Programs and Features" list that refused to leave by themselves. Thanks, I had this problem a while ago - I just gave up and continued with 5.1.3 for the time being, waiting for someone to solve it for me. I also used the Cleanup Utility, and it worked. It removed it from my list of "Programs". However, when I tried to install the connector again (tried with same and newer version)...it still failed. After you ran Cleanup, did you try installing a new Connector? yeah, it really worked in my case..try windows cleanup utility..it really helps u to uninstall any software on windows platform. I'm trying to upgrade from 6.5.5 to 6.8.3, nothing I've done didn't helped, including using the cleanup utility or manually deleting any keys from registry that has any relation to MySQL Connector. I just keep getting the same error: MySQL Connector Net 6.8.3 Setup Wizard ended prematurely. Still searching a way to install it, probably it already have no any connection to the old version, since it's not prompting to uninstall any older version of mysql connector.